Adam Morton is Professor of Philosophy at the University of Oklahoma. His publications include Frames of Mind (1980), Disasters and Dilemmas (Blackwell, 1991), and Philosophy in Practice: An Introduction to the Main Questions (Blackwell, 1995). 1. Beliefs And Their Qualities:. 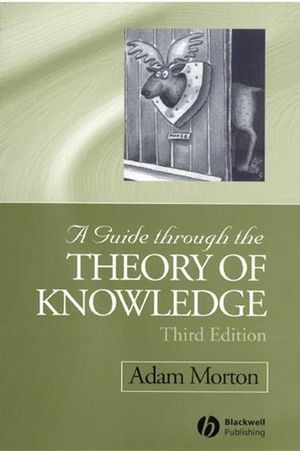 The Basic Questions of The Theory Of Knowledge. What is Special About Perception?. Kant on the Synthetic Apriori. Quine on the Analytic/Synthetic Distinction. Reliability: The Case of the Ancient Mariner. 7. Externalism and Epistemic Virtues:. Skepticism and Knowing that You Know. Conclusion: The Indispensability of Psychology. Thick and Thin Moral Beliefs. Analogies: Color, Humor, and Witches. 10. Bayesian And Naturalist Theories:. A Guide Through The Theory Of Probability. The Bayesian Picture of Evidence. 11. Afterword: Some Future Epistemology:. Guides the reader through the main landmarks of epistemology. Covers both historically important topics and current issues and debates. Includes an entirely new chapter on externalism and epistemic virtues. Each chapter contains comprehension questions, simulation questions, and a list of relevant electronic resources. Revised for clarity and ease of comprehension throughout.